يقع فندق Reef Palms Motel Apartments في منطقة تتمتع بمعالم كثيرة، وتعتبر المكان الأنسب لاكتشاف هذه المدينة رائعة الجمال و ما يحيطها. إن موقعه الجيد الذي يبعد 2. Km فقط عن مركز المدينة يساعد النزلاء على الاستمتاع بمعالم المدينة ونشاطاتها. إن سهولة الوصول من الفندق إلى المعالم السياحية الشهيرة الكثيرة في المدينة هو استثنائي بحد ذاته. يقدم Reef Palms Motel Apartments خدمات لا غبار عليها وكل أشكال اللياقة وحسن الضيافة اللازمة لإسعاد ضيوفه. يقدم الفندق فرصة للاستمتاع بشريحة واسعة من الخدمات بما فيها: واي فاي مجاني في جميع الغرف, خدمة التنظيف يوميًا, خدمة غسيل ذاتية, توصيل من البقالية, خدمات بريدية . تنعكس أجواء Reef Palms Motel Apartments في غرف الضيوف.تلفزيون بشاشة مسطحة, اتصال لاسلكي بالإنترنت, اتصال لاسلكي بشبكة الإنترنت (مجاني), حوض الاسترخاء, غرف لغير المدخنين هي بعض الميزات الموجود في العديد من الغرف. يقدم الفندق مجموعة واسعة من وسائل الراحة المتنوعة، كمثل: مسار جولف - ضمن 3 كم, حمام سباحة خارجي, سبا, تدليك, مسبح (للأطفال). مهما كانت أسبابك لزيارة المدينة، فإن Reef Palms Motel Apartments هو الخيار الأفضل لإقامة مثيرة وممتعة. يُرجى العلم أن أوقات انتقالات المطار -الاستقبال- تكون بين الساعة 10:00 صباحًا والساعة 5:00 مساءً، في حين أن أوقات التوصيل إلى المطار تكون في الساعة 10:00 صباحًا و2:00 مساءً و6:00 مساءً. Was a a very unhappy time for me to be visiting Cairns from Perth. W.A. to say goodbye to my sister who was serious ill and passed away on the 22/2/2019. Coming back to the spacious room each day after being with her was a refuge to ease our pain. The staff were lovely and I thank every one so much. Good for overnight or longer stay. Early closing of reception at 9pm, but clear instructions for after hours access. Very helpful owner and night auditor when I had a late arrival with a large suitcase. 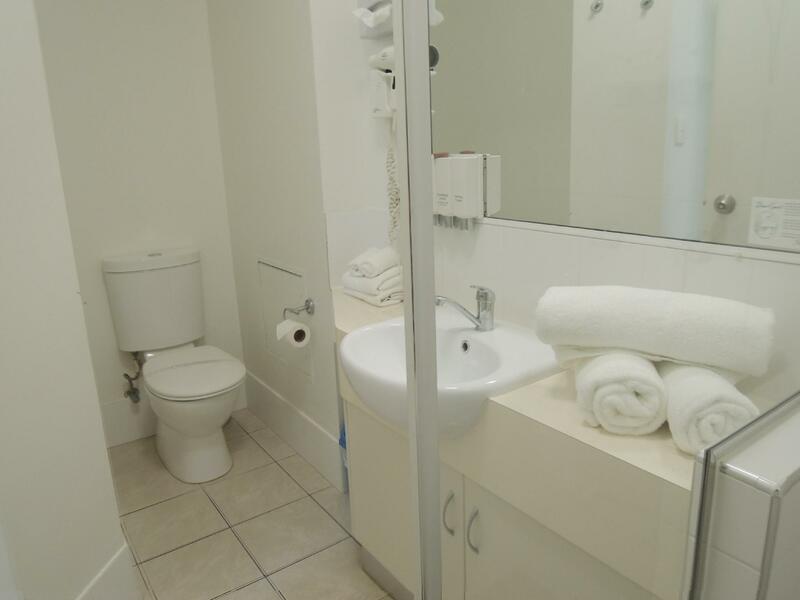 My choice of place to stay in Cairns, as the studios are spacious and clean, the staff very helpful and friendly and it is close to the airport and bus routes. I was traveling with my granddaughter,and booked a twin suite. There were two comfortable queen size beds, roomy bathroom, and an equipped kitchenette. 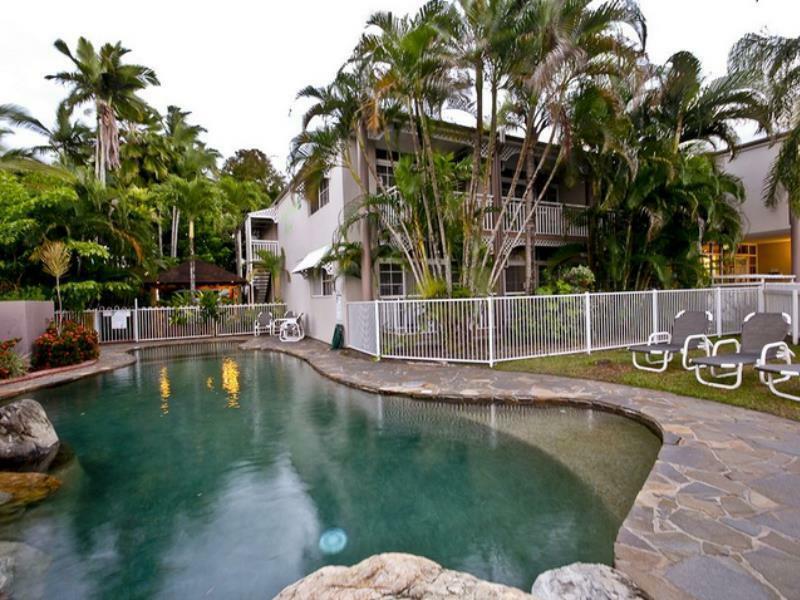 The location is very convenient, with a two block walk to the Esplanade (which runs along the beach). They offer complimentary a airport transfers, which is a nice bonus. Heartily recommended! 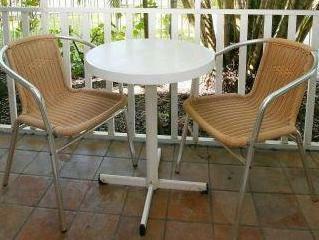 Just what you need for a friendly, comfortable, affordable stay in Cairns. Wonderful, helpful staff and a large, well equipped room. A 15 minute walk to central Cairns along the lovely Esplanade is perhaps the only slight drawback but the area is quiet and leafy and the pool is lovely. Above all, the staff could not be nicer. Recommended. Good option if you’ve got an early morning flight as it’s close to the airport and has parking if you’ve got a hire car. But it’s a ways away from the area around the lagoon with many restaurants so maybe not the best option if you’re looking to stay in Cairns for a few days. Also felt it was a bit overpriced for the location and quality. We chose this hotel for a one night stay before an early morning flight. It was fine for that purpose. Lugging our suitcases up a flight of stairs to our second floor room was a struggle. There is no elevator and no ice machine, but there was an ice cube tray with ice in the room refrigerator. There is no one on duty between about 7 pm and 8 am. Great place to stop over. we were only here for one night. close to airport, lovely staff, clean unit. We enjoyed the spacious room with handicap bathroom, the friendly hotel staff, and the lush surroundings. Loved the pool, but one of us could not get out without help. Perhaps a railing to aid.an old lady?? Enjoyed the shuttle downtown, and to airport, and being able to book a trip to Green Island right there. Better weather would have helped, but we are waterproof..
From the moment we arrived we were treated like family. Warm greeting. Extremely accommodating to our needs. The place was immaculate! Comfortable bed. Quiet room. We asked for a lower level as there is not lift to the upstairs units and it was ready for us when we arrived. Jeff and Lynn were the BEST! Jeff helped my husband choose and book a snorkeling trip to the Great Barrier Reef. Lynn calmed my fears of not being a great swimmer and it turned out to be a magical experience. It was Reef Magic in case you want to have an exceptional time as well. We were on holiday for 4 weeks and stayed in 6 different locations and this was defiantly the best value and time we had. Book with confidence. You won't be sorry. Oh, and the pool is divine!!!!!!!!!! We were there over the Christmas holiday. Not sure if it's due to the holiday season, the shuttle bus was not available on Saturday ，Sunday N public holiday. The shuttle only available early part of the morning n early evening. It's only a one way shuttle to town. Taxi fare is about AUD10 per trip to night market Probably due to festive I'm not sure, the house keeping don't mend your beds. They only change towels . They even forget to replenish our toilet rolls n tissues. The pool is tiny. It's more for soaking. The staffs here are nice and helpful though. Overall not a bad experience. The place is still value for money. 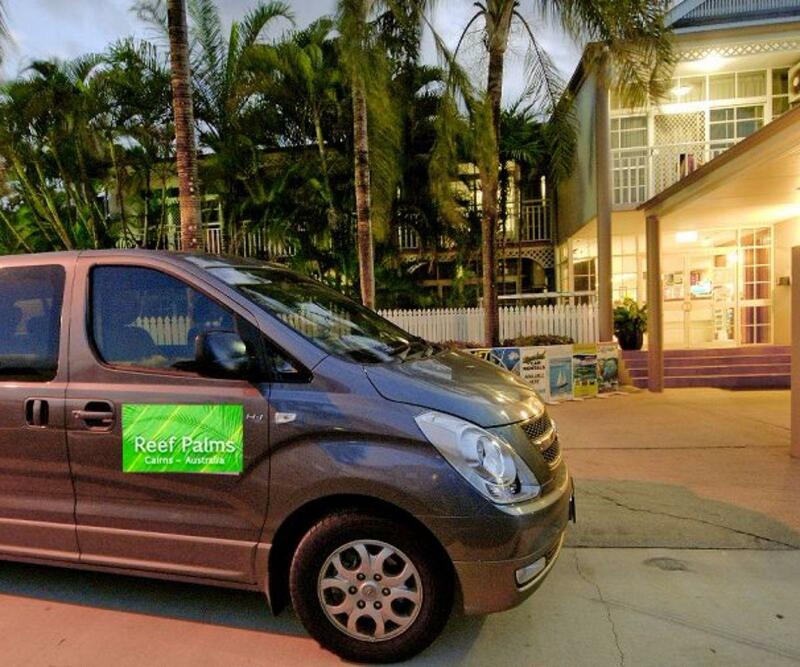 I spent 2 nights at the Reef Palms, and I had a wonderful stay. The rooms were clean, the owners were friendly and helpful. I will definitely stay with the Reef Palms again if I am ever in Cairns again. Friendly owners were quick to help us book the night zoo. Within minutes they had it booked for us. They also helped to give suggestions for how to get around and cooked a decent brekkie. We didn't like huffing all our heavy luggage (3 big bags of scuba equipment) up the stairs, but managed when we made it to the room. Decent size. Mini kitchen. Very liveable. It'd be a good place to live out of for a short week, and though a hike from the center of town, in a decent area with a short walk to the water. Cheers. Liked how it slept 1 big bed 2 twins for my 2 boys and having kitchen was great!! Staff was awesome! The only thing I wish it was closer to downtown, kinda of a far walk, they have a bus that will take you twice but the times never worked out, and I didn’t find out about shuttle until the last day! Staff really needs to tell you they offer a shuttle when you are checking in! Very safe we left our room unlock one whole day and nothing was messed with! Thanks for your feedback Ron, we're glad you enjoyed your stay. We will endeavour to remind all guests of our free shuttle service in the future. Very nice accommodation with helpful and polite staff. The rooms are a very good size, clean, and facilities of a good order.